I tend to steer away from games that don't have a campaign mode. While there are a select few games with multiplayer aspects that carry them into stardom, I always find the missing back story makes my involvement a little less passionate. For the most part this is true with Lead & Gold as well, however the attention to detail and unique systems used for each character type help to immerse the player into a world with no background other than 'hey look, dynamite and guns.. let's blow some stuff up and loot the place'. Which is probably a story everyone can get behind and relate to, right? Lead & Gold operates on a similar control set that many of today's popular 3rd person shooters rely on. As with any PC game your mileage will vary depending on your input hardware and the standard array of adjustments that can be made from the options menu. Of the few short hours I spent with this title, I never ran into any problems with my control set and response times for each of the classes. Speaking of which, I suppose this is as good a time as any to cover the four main archetypes which consist of Blaster, Deputy, Gunslinger, and Trapper. Each carries a specialized set of skills and attributes that not only help you as an individual but also promote the games emphasis on team play. For example, the Trapper (similar to a sniper) class carries a deployable bear trap that will hold an opponent in place for a set amount of time so you can fire from a safe distance, as well as radiating a critical hit boost attribute for teammates in the immediate vicinity. Making sure you stick together to take advantage of these attribute bumps can mean the difference between victory or defeat and it's refreshing to see a game that advertises itself as a "team based shooter" do everything in its power to make sure that you actually play as a team. Visually, Lead & Gold employs most current day bells and whistles to create an aesthetically pleasing backdrop for the ensuing mayhem that will inevitably take place. The carnage doesn't look to shabby either with most of the weapons, explosions, objective items along with little touches like motion blur, blood effects and a minimalistic HUD all check in with passing grades. I realize that a lot of visual effects like dynamic lighting that give games an extra pop are becoming a standard for any developer that wants to stay afloat in today's market, but I never expected to see these techniques implemented so well from a developer that is as young as Fatshark. At times throughout the testing process, I found myself so impressed with some of the most basic scenery and architecture that I would hop into a practice game just to take a second or third look at the level of detail for an object that a lot of gamers will probably never appreciate. On the flip side of that though, the game does have some rather bland looking textures for certain objects that I thought should have scored some priority attention due to the amount of time a player spends staring at because of its placement on the map or character model. 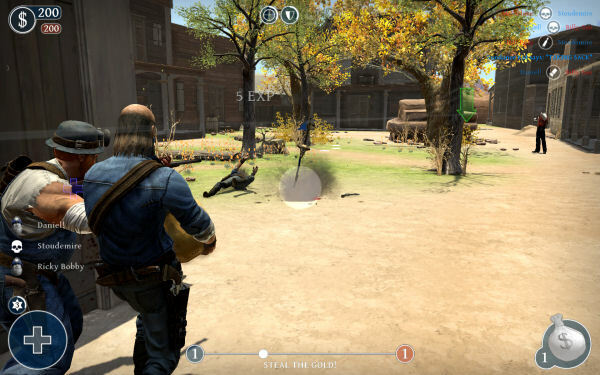 The sounds of this western shooter are well a well crafted ensemble that doesn't really show in the opening stages of the game. In fact it wasn't until I had played a few rounds that I really began to appreciate the rich weapon sounds and quality of explosions that made even my small notebook speakers sound quite decent. Ambient noise as well as game notification sounds are easily on par with some of today's top shelf games, which truly add a pleasant value to the small asking price of this title. Unfortunately there were no voice captures for the game outside of a few small death grunts, which makes sense given the size and scope of everything, but a good taunt here and there or even some mindless chatter to let you know that everyone in the game is in fact not a mute might have humanized the characters a bit. I'll add it to my very short list of wishes for this one and hope they get added the next time around. If you look at the overall value of this package, it doesn't take long to see that Fatshark has stepped up with a winner. The developers set out to appeal to an array of genres and I think they'll eventually get a decent following because of it. Everything from the MMO-feel of their synergy feature, to the ranking and upgrades system that feels right at home with any FPS gamer. The retro spin on game types coupled with a handful of well designed maps (more have already been promised later this year) help everything fit together nicely and ensures that you get your monies worth whether you play non-stop or just a few hours every month. One downside that could turn into the bane of the games existence is its perceived server issues which are being reported by a notable amount of players. I have yet to experience any of these issues myself, but I'm also new to this party and the update history has been busy with fixes and refinements that were released a few weeks before I ever dropped into my first match. If developer interaction and dedication like this continues I can definitely see Lead & Gold turning into a part time distraction for me. In The End, This Game Hath Been Rated: 76%. Get ready for some intense western style shooting as Lead & Gold faces you off against the world in a competition to be the most wanted man (or woman) alive.